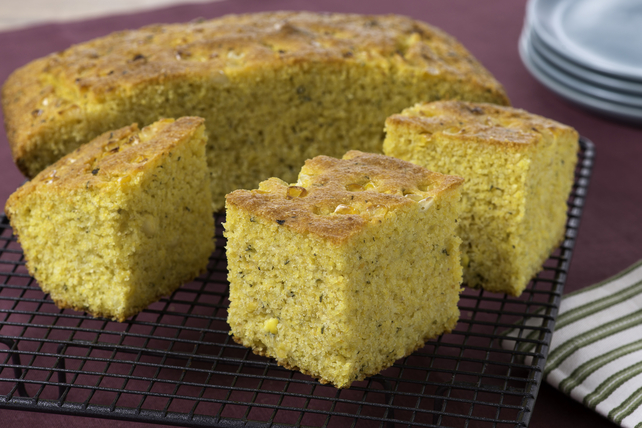 Serve this delicious cornbread with chili, soup or stew. Whisk first 4 ingredients in large bowl until blended. Combine all remaining ingredients except corn in separate bowl. Add to egg mixture; stir just until moistened. Stir in corn. Pour into 8-inch square baking dish sprayed with cooking spray. Bake 40 to 45 min. or until toothpick inserted in centre comes out clean. Cool completely. For added flavour, stir 1/2 cup Cracker Barrel Shredded Double Cheddar Cheese or Cracker Barrel Shredded Tex Mex Cheese into prepared batter before pouring into prepared baking dish and baking as directed.